Tom chisel carves these small wooden Santas, then paints and antiques each one by hand. Once the carving is ready, a 3/8" hole is drilled into the bottom and a solid oak dowel is glued into the piece. A quality grade cork is then attached to the dowel. Unlike most decorative stoppers, our corks will NOT break off! Because the cork is firmly attached to the dowel which is glued deep within the carving - you never have to worry about pulling the stopper and leaving the cork stuck in your bottle of wine. Tom's hand carved wooden bottle stoppers go fast, especially around the holidays. 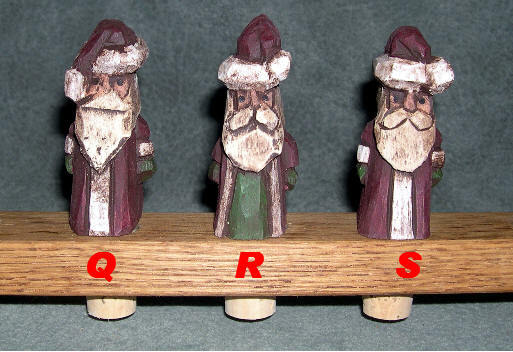 They make great gifts for wine lovers and Santa collectors! Please note each stopper is a one of a kind (OOAK) carving. Our shopping cart allows you to adjust totals. Please DO NOT do that on these items or your order will be refunded!